Cal Chapman speared this monster pike today which was 40″ and weighed 18# 14 oz. Tower Pond. That pike won’t be eating anymore trout in that pond or in the Black River. Congrats Cal. 6.6 lbs is leading the board. Another busy morning dipping bait at Hamlin (Bait) Grocery. Still much buzz about all the fish coming in. Though it has slowed down , still guys catching limits of nice bluegill. Average size is now 7-9inch with the occasional 10 plus inches. A few that are focusing on Perch have done well, overall much smaller fish. A few nice pike as well as some very nice walleye have been brought into the store for my viewing pleasure, but mums the word on location of catch. A good starting point may be Indian Pete West to the Narrows. 6 inch. + in most areas. Sleds & quads have been out for over 2 weeks. If you wonder out on the lower lake be mindful of many weak areas of ice. Use common sense, and above all remember ” No ice is safe ice”. Just about all bait has been used and tried this last week. Wax worms and red spikes seem to be popular for bluegill. Golden and suckers for top-up though suckers tend to be a little more hardy. Tungsten gigs are a favorite ….. In colors or green, yellow , orange ,chartreuse and glow when available. The hot pick of the week: red, white & blue. Be sure to stop in and say hello, we enjoy hearing all your “BIG FISH” stories. Be safe & Fish-on ! Stop in for all your ice fishing needs! We have Blues, Perch minnows, Golden shiners, and suckers! Waxies, spikes (red and white), and mousees! Maybe the fish are starting to get over their lockjaw… and just in time for this weekend’s T.U.T. fishing tournament. Collin from HL started his stringer with this nice walleye. Matthew Bowman from Mt. Pleasant is back again with a pair of pike and will be heading out again in the a.m. with his dad. HL Legend, Clare Gee scored first this morning with a keeper walleye on a Foo Flyer.. chief rival Dave wasn’t impressed.. They fished together in the evening and Glare had the last laugh with his 31″ 8lb pike and 17″ walleye using a Fish Bones Froggie jig using a single hook with minnow. A customer was impressed with Dave’s fish – he thought it was “a very nice perch”. The first fish of the morning didn’t take long for the guys staying in our sleeper shanty. James Rush caught this 22″ walleye on a tip-up with a Lyman’s Golden Shiner. Thanks Bob Stockton from hooked up on higgins.our group had an awesome time with u on the lake today!!! You are one hell of a guide couldn’t have asked for a better teacher or new friend thanks again stay safe and keep ur lines tight! Another great day of fishing. Father and son, my girl and I. We all limited out on some nice lakers. Thanks Carl! It was my pleasure. Thank you Bob for a great day and all your hard work. My son had a blast, Bob probably walked 5 miles just resetting baits for us. If you want top notch guide this guy knows his stuff!! Randy Marquiss from Midland caught this 38 5/8″ beast that weighed in at 14.8 lbs on a Lyman’s Blue Minnow under a tip-up in 7′ of water on the south shore weed bed on Houghton Lake. Our phone rings constantly from people all over the state looking for ice. We Have Ice! Fishable in selected areas. The South East side of Lake Mitchell, off the boat launch area by Thirsty’s has 3″. This area is one of the spear anglers favorite for Pike and usually good for Gills and Crappie for the Jiggers. There’s aleady a few pop-up shanties and a permanent in the area. There is about 3 1/2″ – 5 1/2″ of ice in Big Cove and 3″ – 4″ of ice in Small Cove. This is a favorite spot for pan fishermen and tip-up anglers for Pike and Walleye. Expect to find 3″ – 4″ behind the Sands motel and Marina restaurant on the West side of Lake Cadillac. A few have tried by the Causeway along M-115, a good Crappie and tip-up area. But there is less ice. Best to bypass this area until the ice gets better. The cold night temperatures should help in making ice. Other popular areas on Lake Cadillac like the East side by the city and Kenwood Park are not safe at this writing. One hit with a spud goes through in these areas with junky white ice. Like Lake Mitchell soon we will be exploring other areas. Even if you see other anglers on the ice, use your spud to check your way. Don’t go out without a pair of Ice Spikes! Ice was starting to form on many of the smaller lakes however there is no safe ice yet. The big lakes like Charlevoix and Walloon still had open water. Betsie River: Steelhead fishing has been good despite the cold. Manistee River: Steelhead fishing has been good on all sections, from the mouth up to Tippy Dam. The rain in December brought good numbers of fish into the river. Anglers are still catching some fresh fish throughout the river system. Try spawn, beads or a jig and wax worm. Pere Marquette River: Steelhead fishing has been good despite the cold. Try fishing the deeper holes. Not much activity up here just yet. Starting to get ice, but still thin in most places. Snow showers the end of the week could dump enough snow to slow the freezing process. Anglers would be wise to wait for another week or two. Lake Gogebic: Ice anglers were taking some walleye in the shallows when jigging rapalas or using sucker minnows. A few perch were also taken on jigs with wigglers or spikes. Anglers are reminded to use caution especially with snow on the lake which makes it harder to see the bad spots. Little Bay De Noc: Was making ice north of Gladstone. Ice has formed from the “Narrows” north to the head of the Bay but ice conditions are DANGEROUS especially with 2 to 3 inches of snow cover. A couple anglers were walking out near Butler Island but again extreme caution needs to be used. Those looking for perch said the bite was slow. St. Mary’s River: Anglers were fishing Munuscong Bay most likely for perch. Remember, first ice is dangerous ice and extreme caution needs to be used. Huron River: Anglers are taking some steelhead near Labo Park. Most are boat anglers fishing the deep holes. Lake St. Clair: Had no safe ice. Skim ice was forming along the shoreline as well as in the canals and marinas. Wind can move the shore ice around and plug up the area around a boat launch very quickly so boating season on the lake is pretty much over. Cold weather over the next few days could make enough ice to allow some fishing however rain and warmer temperatures by the end of the week could ruin those chances. St. Clair River: Fishing activity has been light. Strong winds have stirred up the south end of Lake Huron and has made the river muddy. There has been little ice formation so Lake Huron and the St. Clair River were pretty much ice free. Saginaw Bay: There is too much ice for shore fishing but not enough for ice fishing. There is a layer of “shove ice or blow ice” that blew in along the shoreline around the entire bay and extends out anywhere from 200 to 400 yards. Fishing is pretty much confined to sitting on docks in marina basins and perch fishing through the holes in the ice. Marina basins that anglers might want to try include Eagle Bay up near Standish, Gambil’s Landing near Pinconning, Linwood, Sunset Bay near Unionville, Sebewaing City Marina on the Sebewaing River, Bay Shore near Bay Port and the basins off the Pigeon River in Caseville. Kawkawlin River: Was iced over. Saginaw River: Had boat anglers targeting walleye just downstream from the Independence Bridge however the river and the launches were icing up. Marina basins and boat launches at most locations on the river were not useable. The only exception was the Zilwaukee ramp and the McGillvary Street ramp which is just downstream of the Independence Bridge. Walleye anglers were fishing around the U.S.S. Edson however boat anglers need to be vigilant and watch for large sheets of ice that that could keep them from moving freely around the river. Anyone taking to a boat in these conditions needs to be sure the motor is running properly, wear lots of warm clothes, a life jacket, and be sure to have a cell phone in case they need to call for help. Tittabawassee River: Was filled with floating ice. The boat ramps at Gordonville Road and Center Road are iced in and not useable. No ice fishing as the waters are still wide open. A few small lakes and ponds may start to get ice this week however it will not be safe ice. St. Joseph River: Has open water and anglers are still catching steelhead. Kalamazoo River: Open water fishing remains. Anglers are still taking a fair to good number of steelhead. Grand River at Grand Rapids: Continues to produce steelhead and the occasional walleye. Rogue River: Still has the occasional steelhead hitting on flies or spawn. Muskegon River: Has open water and anglers are catching steelhead. Denny Hossmer from Marn, MI just returned from his fishing trip with Captain Chip from Game Hog Charters. 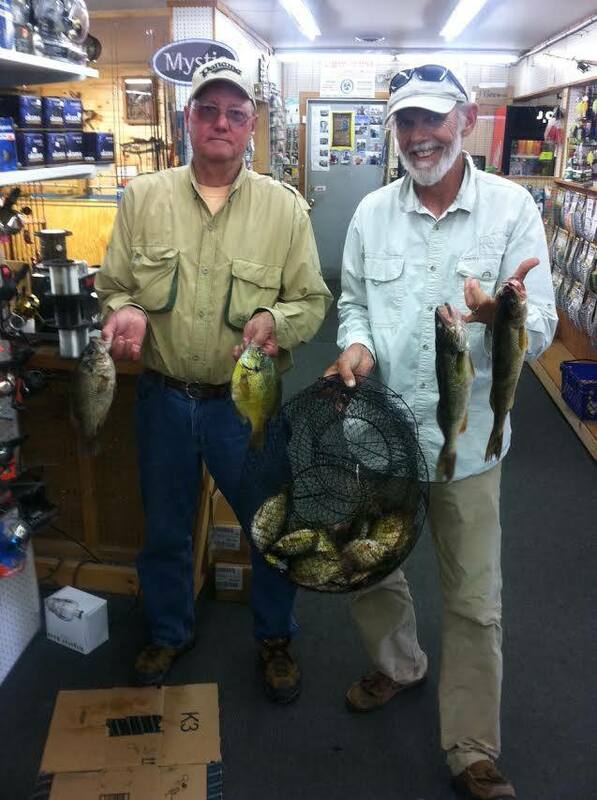 They caught a big basket full of fish including TWO Master Angler qualifying fish…Blue Gill and Rock Bass. They were fishing at trusty, old #9 Muddy Bay using live bait and Hot n Tots. Well done, Denny & Chip! Hunter Atkins caught this beautiful Bass this weekend & reeled it in with his Lightning Mc Queen fishing pole. 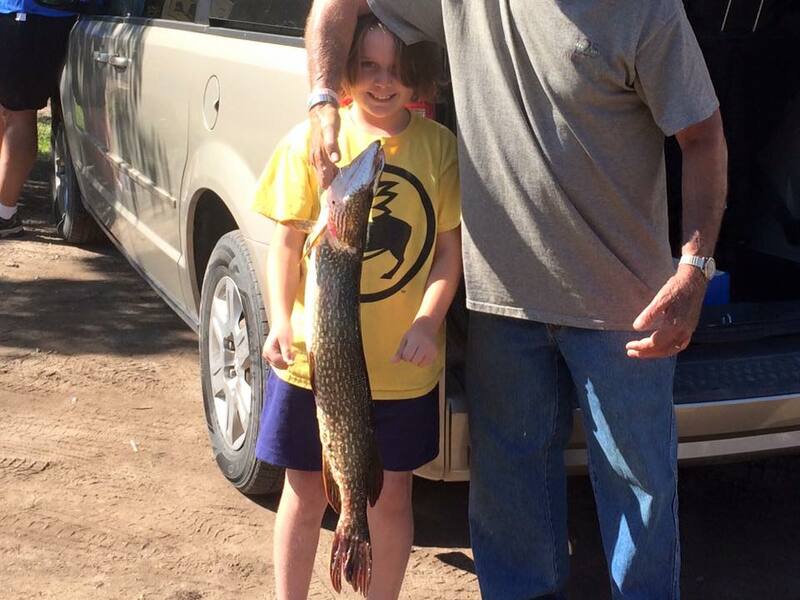 Jamie Helmus caught this 32″ Northern on Lake Sapphire. Walleye Fishing has been good on Lake Bellaire, Manistee Lake by Kalkaska, Lake Leeelanau, Long Lake, Houghton Lake, Lake Margrethe this week with leeches working the best. Jays in Gaylord report many fisherman are heading to Eastern Up Cedarville and Drummond Island to fish herring this week and are really selling waxworms. Drummond Island: Fly hatches were helping anglers take limit catches of lake herring. Good catches were reported in 20 feet at Harbor and Howard Island. Try three cranks off the bottom with brown and red tear drop lures tipped with a wax worm. Just east of Fairbank Point, herring were good just off the bottom in 21 feet. Anglers caught walleye at Arrow Island when trolling chrome and chartreuse crank baits in 18 feet. 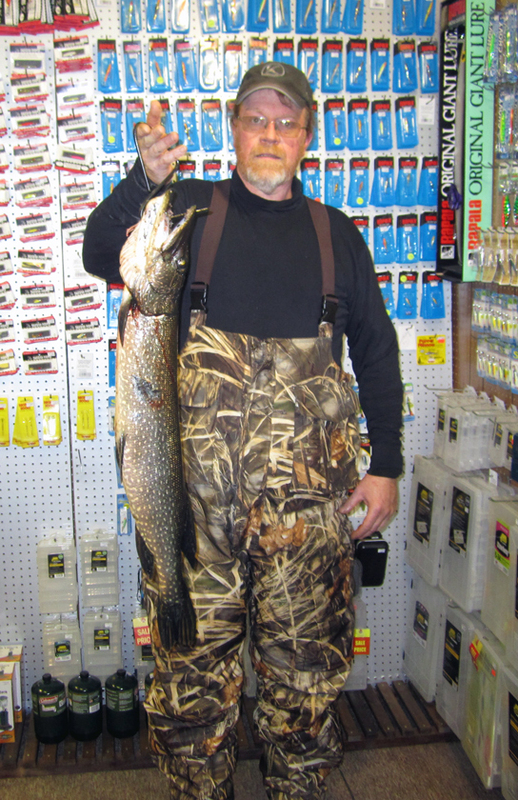 Cedarville and Hessel: Have excellent pike fishing from Hessel Bay through Government Bay. Anglers are casting, trolling, or still-fishing with chubs. The shallow bays are producing as well. Good perch fishing in Moscow Channel and Hessel Bay. A good number of herring were caught in Prentice Bay, McKay Bay and the east end of Moscow Channel. Saginaw Bay: Walleye fishing remains good but it is slowing down. Walleye show signs of moving to deeper water as do the lake trout as the weather warms up. Good walleye action five miles north of Buoys 1 & 2, northwest of the Spark Plug (Buoys 11 & 12) in 28 feet, and near the Sailboat Buoys G, A, and B. Near the mouth of the Kawkawlin River, the early morning bite was best over the weed beds in 12 to 14 feet when trolling un-weighted or very light crawler harnesses. The trick is to keep them above the weeds. They are still taking walleye off the Callahan Reef, Finn Road, along the Slot and off the Bar when using crawler harnesses, crank baits and spoons. Best spinner colors were purple, pink, chartreuse and brass. The deeper areas of Wildfowl Bay were producing some walleye. Off Caseville, most boats are either fishing north of Big Charity or off Oak Point. At Port Austin, walleye anglers headed west toward Hat Reef in 35 to 38 feet or northwest of Big Charity in 40 to 60 feet. Harbor Springs: Boat anglers were fishing north of Harbor Point. Bass anglers were disappointed as only a couple small fish were caught. Petoskey: Boat anglers are fishing off the water treatment plant and around Bay Harbor for lake trout. The “Bobber Hole” near the mouth of the Bear River was slow but anglers did manage to catch rock bass, freshwater drum, bullhead, a few small perch or bass. Try worms without a bobber. Pier anglers caught small bass. Bear River: Anglers fishing the dam caught a lot of smaller rock bass and some bullhead. Try worms and artificial eggs. Charlevoix: Anglers are doing well for lake trout. The channel has been a bit slow. Anglers are catching mostly undersize smallmouth bass. Worms and leeches work best. Cisco, freshwater drum and rock bass were also caught. Elk River: Smallmouth are hitting tube baits, leeches, crawlers, or minnows. Traverse City: The East Bay had fair lake trout fishing in 70 to 120 feet. Some were suspended about 70 feet down while others were near the bottom. Those jigging caught a few whitefish. Smallmouth bass action was decent in 10 to 20 feet. In the West Bay, lake trout were fair with most caught while trolling or jigging in 90 to 115 feet. There have been rumors of a few chinook salmon caught. Boardman River: Fishing was good. Those fishing upstream near the two forks caught some large brown trout on flies at dusk. Morning hatches of Trico’s and Blue Wing Olives are getting some fish to rise. Some good size browns were caught below Sabin Dam. Steelhead and smallmouth bass were caught at the Union Street Dam. Carp are still in the river. Smallmouth bass and walleye were caught near the mouth on live bait. Frankfort: Chinook salmon are hitting and good catches were reported by those trolling north and targeting the top 80 feet in waters 120 to 150 feet deep with J-plugs, spoons and meat rigs. Steelhead and lake trout were caught in the top 40 feet. South winds are warming the water which was up near 64 degrees. Brown trout are still being caught in the channel between the piers. Onekama: The Barrel is still producing good catches of lake trout for those bouncing cowbells and spin-glo’s on the bottom. Those heading out in the early morning caught chinook on meat rigs in 120 to 200 feet. Portage Lake: Is producing a good number of largemouth but fewer smallmouth bass. Most fish were caught along the shoreline and the drops in deeper water. Manistee: Those fishing the temperature breaks are doing well for steelhead and lake trout. Try the top 30 feet with orange spoons. A couple salmon were caught 30 to 90 feet down in 120 to 240 feet. Pier anglers caught brown trout when using alewife or casting spoons. Manistee River: Anglers are catching steelhead and brown trout. Ludington: Boats anglers are finding steelhead and lake trout but the salmon action was slow. The few caught were taken 25 to 100 feet down in 100 to 250 feet with orange spoons and green flies. Lake trout were caught bottom bouncing with dodgers and spin-glo’s. 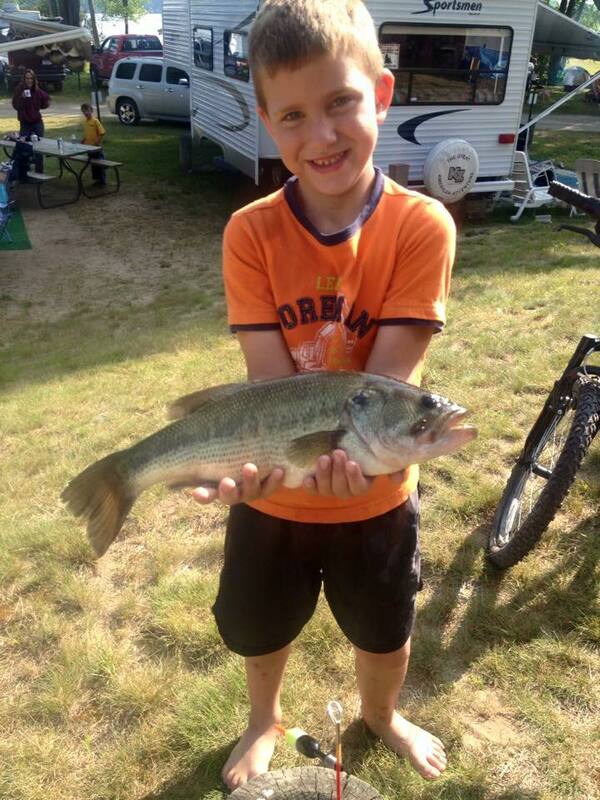 Pentwater: Fishing has turned on with nice catches reported. Some fishing close to port limited out but most were fishing in 100 feet. Baitfish are in the channel. A couple steelhead and redhorse suckers were caught by pier anglers. Pentwater Lake: Shore anglers caught bullhead in the evening. Boat anglers caught smallmouth bass and pike. Rogers City: Lake trout fishing is still good. Most anglers are still catching anywhere from 1-4 fish per boat but some are taking limit catches. A few more chinook, coho and steelhead were in the mix. The lake trout are both suspended or near the bottom in waters 50 feet or deeper. Try cowbells or dodgers with spin-glo’s and spoons in bright colors like green or yellow. A very large mayfly hatch was underway. Scum lines were starting to form. Anglers are trolling around them with orange and green spoons. A few chinook were caught in 55 to 125 feet but the fish are scattered. Try green, blue, black or white spoons. Glow spoons work best first and last light. East & West Twin Lakes: Walleye were caught in the 10 foot holes on West Twin. Bluegill fishing was great along the shoreline. Perch fishing picked up in the 8 foot holes. Try natural baits. East Twin was slow for all species. Alpena: Walleyes are still being caught with some boats doing real well and others struggling to find them. They are starting to move out to deeper water. Try 12 to 18 feet down in 20 to 40 feet with body baits or crawler harnesses near the Red Can, Grass Island, behind Sulphur Island and around Thunder Bay Island. Lake trout were caught straight off the “Humps”, around Thunder Bay Island and out towards the wreck in 60 to 120 feet. They are just off the bottom or suspended throughout the water column. The occasional salmon or steelhead were caught up high. Thunder Bay River: A few walleye were caught on crawler harnesses or body baits near the draw-bridge. Shore anglers had slow fishing with only a few rock bass or freshwater drum taken on worms. Harrisville: A variety of fish are coming in good numbers. Lake trout have been the most abundant with the occasional steelhead, chinook, Atlantic and walleye. Lake trout are near the bottom in 80 to 150 feet. Watch out for nets, and check locations before fishing this area as the nets seem to be in waters 130 feet and deeper. The nets are marked very well as long as you don’t have a lot of wave action you will be able to see them. Steelhead, chinook and Atlantic salmon were caught north of the harbor toward Sturgeon Point. These fish are 10 to 25 feet down in 70 to 90 feet and hitting on orange and blue spoons. Walleye are still north of the harbor between Sturgeon Point and the Black River. Crawler harnesses and reef runners are best. Oscoda: Pier fishing has been up and down. Walleye have been caught throughout the night but seem to shut down before sun up. Catfish are also being caught throughout the night and into early morning on crawlers and leeches. Look upriver for walleye as some were reported at Foote Dam. Lake trout were scarce. The fish that were caught were in 70 to 150 feet of water and suspended. Spread your baits throughout the water column. Higgins Lake: Was producing some perch but anglers had to do some searching to find them. Try 30 to 40 feet with minnows or wax worms. Some lake trout were caught in 80 to 100 feet by those jigging or trolling with body baits and cowbells with spoons. 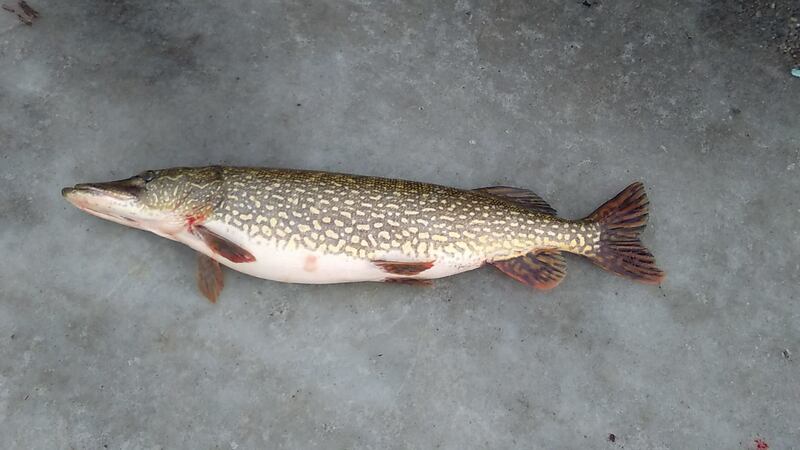 A couple pike were caught on sucker minnows under a slip bobber near the Main Island. Rock bass are everywhere. Lake St. Helen: Was producing bluegills and pumpkinseed. A few walleye were caught by those drifting crawlers and leeches. Tawas: Those trolling for walleye did very well in 50 feet out past Tawas Point and off Whitestone Point in 40 to 45 feet. Some limit catches were reported. Pier fishing was slow with only a few catfish or freshwater drum caught. Tawas River: Shore anglers in the lower river were catching the odd catfish, freshwater drum or pike. Au Gres: Walleye fishing was still good and the port was busy. Many were going over to the Charity Islands or fishing in 30 to 45 feet between Point Lookout and Pointe Au Gres. A few were heading south and fishing north of Buoys 1 & 2 which has been a universal hot spot for the past couple weeks. Limit catches have been common and pretty much everyone is getting some fish. Au Gres River: Shore anglers caught a few catfish, freshwater drum and bass. Keweenaw Bay: Fishing was very slow with only a few lake trout taken. A couple limit catches were taken in the South Portage Entry. Anglers tried several different depths and did not catch anything until they jigged in 315 feet. Fishing in Traverse Bay was slow. Lake Gogebic: Walleye have been caught by those using a range of methods including still-fishing with minnows, jigging minnows off the bottom and trolling crank baits. Walleye were found both shallow and in deep water. Perch anglers were few and those out reported poor catch rates. 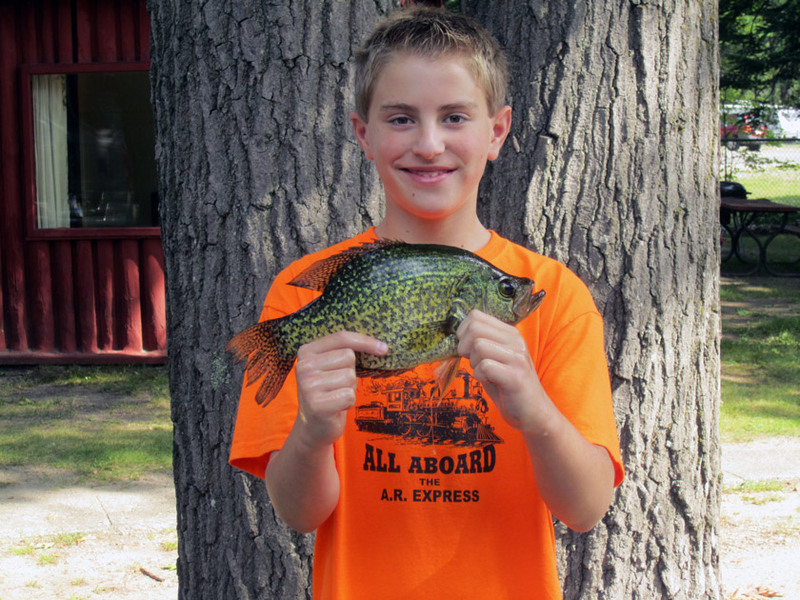 Those fishing from the public pier in Berglund were catching sunfish and rock bass on worms. Marquette: Those trolling for lake trout in the Upper and Lower Harbor had mixed results and were getting anywhere from three to a limit catch in a five hour trip. Some did make trips over to Shot Point and had fair results in 200 to 250 feet. Most are fishing north and east from the Sand Hole, north of the White Rocks, the “humps” off Granite Island, near Little Presque Isle and the Clay Banks. Concentrate near the bottom in 200 to 250 feet. Stannard Rock was producing excellent results with fish ranging 3 to 15 pounds when jigging with spoons, flies and cut bait. Surface water temperatures were in the mid 50’s. Au Train Lake: Boat anglers targeting pike did catch a couple legal size fish on minnows. Those using spinner rigs and crawlers caught smaller fish. Walleye anglers had some action but catch rates were still slow. Try leeches, crawlers or trolling small crank baits. The weeds are becoming increasingly dense. Smallmouth bass were seen along the shoreline. Munising: Reports indicate low catch rates with only a couple splake and lake trout caught in 100 to 200 feet. They are trolling all over to find fish including Trout Bay and Sand Point. Fresh spawn has been the bait of choice off the dock of the Anna River. 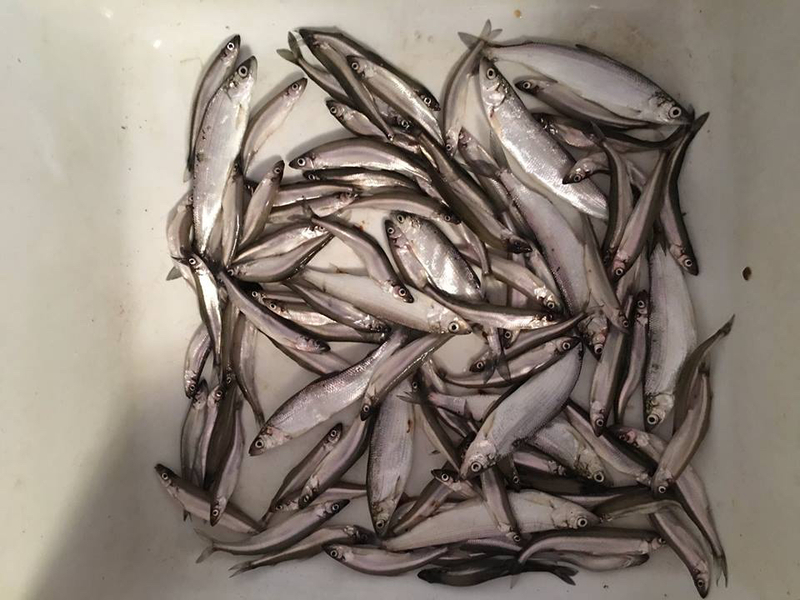 Many small splake were caught and released. Grand Marais: Anglers are fishing off the end of the pier and trolling deep about 5 to 10 miles out. Whitefish were hit-or-miss. The fish were averaging 13 inches but a few bigger fish were also caught on a single egg. Catch rates for lake trout were good with anglers bringing in fish every trip. Bodi Lake: Which is in the Bodi Lake State Forest Campground in northeastern Luce County has reopened the boat launch. Improvements to the launch have been completed. Anglers should find it much easier to launch and retrieve their boats. South Manistique Lake: Bluegills are beginning to make their way out to deeper water. Large numbers of fish have been caught near Sherman Road but most were small. Pike numbers increased with most hitting on crawler harnesses. Walleye numbers were down but catch rates were good on Big Manistique. DeTour: The Cadis Fly hatch improved. Anglers have switched from salmon and trout fishing to lake herring. The few targeting salmon did catch a couple Atlantic salmon about 15 feet down in 50 feet when long-lining purple and chrome spoons. Dark brown flies are producing Atlantic salmon for those trolling about halfway down in 40 feet west of the lighthouse. Lake Erie: Walleye and yellow perch fishing picked up with more anglers reporting limit catches of walleye when trolling crawler harnesses in 20 to 25 feet around Stony Point, the Fermi stacks and the Banana Dike. Some did well when trolling crank baits and spoons. Perch numbers are on the rise with more anglers reporting luck in 15 to 22 feet while jigging with minnows. Freshwater drum are everywhere. Lenawee County: Panfish anglers were doing well in Devils Lake when drifting crawlers for bluegills suspended in 4 to 8 feet. A few pike and bass were caught on spinner baits and crank baits along the drop-offs. With the recent rains and runoff, Lake Hudson was very cloudy and the bite was slow with only a handful of bass and some panfish caught. With the weeds getting thicker, try fishing the deeper channels with bright colored baits. Detroit River: Anglers reported a decrease in catch rates for walleye on the northern half of the Canadian side. The better fishing was still found near the whiskey plant, casino, salt mines and the cow pasture. Walleye fishing on the Michigan side was rated as poor even as they look deeper in 25 to 40 feet. Most were bottom bouncing crawler harnesses or hand-lining with spoons and stick baits. A few yellow perch were caught downriver around the islands and the Cross-Dike. No muskie to report. Bass fishing was fair to poor for those fishing around the islands or in the cuts and canals. Boat anglers continue to target or catch walleye, bass, freshwater drum, rock bass, white bass, white perch, muskie or pike. Boat anglers are advised to bring waterproof footwear to use while launching and trailering vessels because a lot of the launch docks are partially underwater. Lake St. Clair: Surface water temperatures are in the low 70’s. Mayfly and caddis fly hatches were heavy over the last week. Walleye fishing was slow except for a few whipping after dark. Bass fishing was good with most fish caught in waters at least 12 feet deep. Muskie fishing remains good in Canadian waters. St. Clair River: Surface waters temperatures were in the low 60’s. Walleye fishing was slow. Bass fishing was good. Muskie fishing was good in Canadian waters but only fair in Michigan waters. Lexington & Port Sanilac: Lake trout and steelhead are moving to deeper water. Try fishing near the bottom in 100 to 140 feet. Boats are marking lots of fish but the bite was slow. Perch fishing was very slow. Harbor Beach: Steelhead have been caught out near the scum line. Try the top 25 feet in 60 feet with bright orange, green and yellow spoons with 2, 3, 5, and 10 color lead lines with offshore boards. Lake trout were caught in 100 to 120 feet north of the harbor with downriggers and clean spoons or dodgers and squid off the bottom. Blue, green, orange or yellow with black dots were good colors. Grindstone City: Walleye, bass and whitefish were caught in 40 to 48 feet when trolling crank baits on 6 colors of lead core off Burnt Cabin Point. Fire-tiger and crayfish (anything with orange on it) were the best colors. Charters out of Grindstone were getting lake trout in 120 to 130 feet straight north of the harbor. Sanford Lake: Has excellent crappie fishing on small pink jigs with a white twister-tail or minnow. Bluegills and sunfish were also caught. Pike fishing picked up and the old reliable red and white Daredevle spoon worked best. Bass fishing was good. St. Joseph: Perch fishing continues to be good in 30 to 40 feet. Salmon fishing was not consistent as the fish are scattered. The few caught were taken in 75 to 100 feet. Pier fishing for steelhead slowed with only a couple fish taken on shrimp or alewife. South Haven: Pier anglers are catching the occasional steelhead on alewife. Perch fishing was very slow. The few caught were scattered in 18 to 45 feet. Salmon fishing was also slow with only a few boats catching fish in 60 to 100 feet and deeper. Kalamazoo River: A few walleye were caught near the Allegan Dam. Bass anglers have done well with artificial worms and grubs. Look for panfish in the backwaters. Grand Haven: Windy weather has turned the water continuously so water temperatures were consistent throughout. Water in the 40’s brought a large number of steelhead close to shore. Boat anglers had decent catches for steelhead and chinook salmon. A few perch were caught in shallower water. Pier angler did well when using shrimp and alewife. A couple chinook and brown trout were caught. Grand River at Grand Rapids: Channel and flathead catfish are being caught off the wall when using worms and bluegills. More walleye are being caught when using minnows off the wall or when drifting. Summer steelhead are beginning to make their way to the dam with about a half dozen landed in the last week by those drifting yarn and beads. Grand River at Lansing: Catfish are being caught near the dam at Moore’s Park. Try crawlers, small bluegills or cut bait. Smallmouth bass were hitting on tube baits near the Brenke Fish Ladder. Muskegon: Boat anglers did best up and down the water column as the fish were scattered. Catch rates were slow with meat rigs out fishing spoons 2 to 1. Try running gold spoons. Muskegon River: Anglers are catching good number of brown trout and a few more Skamania. Catch rates were good throughout the river including the Hardy Dam and Croton Dam. Bass anglers are doing well with top water lures and soft plastics. Those fly fishing have also done well for trout and bass. Whitehall: Had a few boat anglers that set lines when out on a pleasure cruise and were surprised when they caught chinook salmon. Baitfish are inside the channel. Boat anglers will want to try 80 to 100 feet. Pier anglers took steelhead, coho and brown trout after netting alewife for bait. 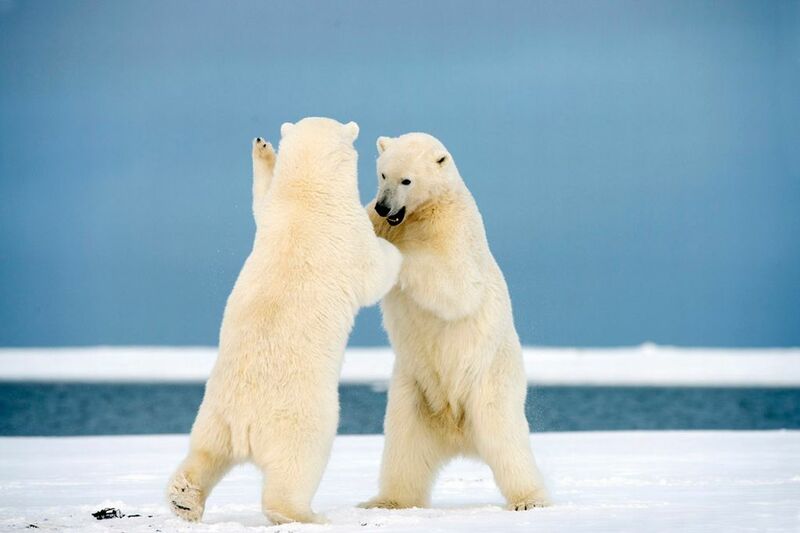 We’re back on the ice! We had temps in the single digits last night making more ice for this weekend and many lakes have safe ice again but use a spud and check all the way out. Small Shallow Lakes around Traverse City have safe ice with many fishing Spider Lake, Arbutus, Ellis Lake, Lake Dubonnet, Long Lake went over but is not safe. One of our regulars just stopped in the shop with an ice report. We can only speak to the ice in front of our store (south shore), but there is about 5 inches along our shore and up to 6 1/2″ out about a half mile. He was able to get on with his quad. We’re waiting to hear reports for the rest of the lake, so if you’re venturing out from another location, use extreme caution. 36″ and 10lbs caught on a Golden Shiner from Lyman’s on the Lake with the freshest bait, LOTL. The ice is getting a little soft in spots, so you might want to wait a few days before heading back out. 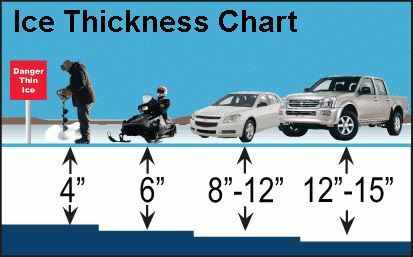 Lake Missaukee has 4 to 8 inches of ice and most are fishing from Lake City shoreline as Green Rd has 5 inches 10″ on the east side and the coves are safe. Call Miller’s Corner @ 231-839-0440 for latest info and the fish are biting. Baldwin Area is on the edge with some lakes with safe ice. Mancelona Sports reports many small lakes in the area are froze and safe with Lake Bellaire going over a couple days age. The cold nights have made all the difference. Anglers have returned to the coves on Mitchell, the Spear Colony at Thirsty’s and Kenwood Park on Cadillac. Good catches of crappie, gills, some perch and large pike are common. Even the walleye have been hungry. The Big Question – How much ice? Four to 8 inches with an inch of snow cover depending on where you are. Ice fishing has been put on hold until ice conditions improve. Oscoda: Few anglers have been out however pier anglers may still find the occasional steelhead or walleye. Au Sable River: Anglers are still getting some steelhead throughout the river system. Boat and shore anglers are using spawn or a jig and wax worm. No word on walleye, they seem to be gone. Higgins Lake: Had open water, no ice. Boat anglers were still heading out and targeting whitefish and lake trout. Houghton Lake: As of this report, the ice was no longer safe. With the return of cold weather, the ice might shore back up by the end of the week. Those heading out will need to use extreme caution. 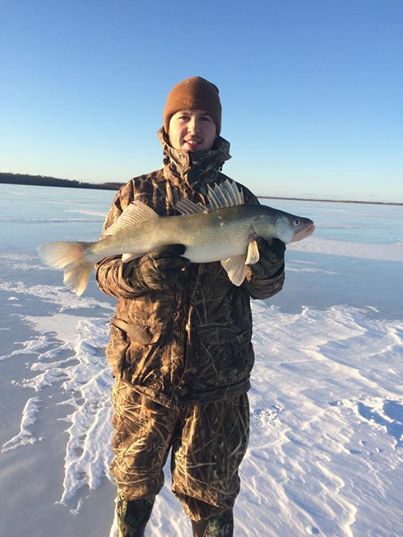 Before the big thaw, walleye anglers were doing very well. The inland lakes still had ice but it was deteriorating with the extremely warm weather. Anyone venturing out now needs to use extreme caution. Shoreline ice was thin and some reported water running down the holes which will only weaken the ice more. Much colder air by the end of the week should restart the freezing process. On Lake Michigan, a couple boats were out trolling along the shoreline and in the harbors. They caught steelhead, brown trout and a couple small chinook salmon. Frankfort: Surf and pier anglers are still getting a few fish. Betsie River: Steelhead fishing is still viable, although few are doing it. Reports have not been great but fish are being caught. Lake Cadillac: Still had ice however it was deteriorating. Anglers need to use extreme caution until colder weather has a chance to shore the ice back up. Be sure to use a spud to check the ice in front of you. Those that have been out reported good fishing. Lake Mitchell: Still had some ice however it was melting. Extreme caution needs to used. Those jigging or using tip-ups have caught fish. Lake Missaukee: Is producing some pike and walleye. Manistee: Pier anglers and those surfcasting are getting a few fish. Manistee River: Steelhead are still available in both the Big and Little Manistee even though it has not been a banner fall run. Try spawn, wax worms or plugs. Ludington: Surf and pier anglers are still getting a few fish. In the northern sections, the recent warm weather did weaken the ice. Heavy snow added weight and caused ponding on the surface. Anglers are reminded to use extreme caution and don’t forget the traditional safety gear such as a spud, ice pics, a throwable flotation device, a rope and the buddy-system. Anglers in the eastern half of the Upper Peninsula were ice fishing on the inland lakes however no sleds were heading out, foot traffic only. Lakes around Newbery with yellow perch and panfish are being targeted. The next couple weeks are showing temperatures that will slowly improve ice conditions. Portage Lake: In Houghton County was producing a good number of walleye and pike. Lake Gogebic: Was also producing a good number of walleye and pike. Anglers are jigging and using tip-ups. Little Bay De Noc: Had enough ice north of Gladstone that anglers were traveling on ORV’s and snowmobiles. The warmer weather and rain made conditions sloppy. Anglers have been fishing for yellow perch in the Butler Island area and walleye in the central and northern parts of the Bay including the First, Second and Center Reefs. There was some ice but more open water south of Gladstone. Lake Erie: The only reports were a few decent perch caught in the Metro Park Marina. Huron River: Anglers are still catching steelhead. Shore anglers are floating jigs with wax worms and boat anglers were back bouncing with Hot-n-Tots. Detroit River: Anglers were going out but no reports were coming in. Those heading out are usually targeting walleye or perch. Muskie season is closed. Lake St. Clair: Had no fishable ice anywhere. Much colder temperatures should start producing ice by the weekend. Muskie season closed on December 15th. St. Clair River: Muskie season is closed. Shore anglers fishing off the wall at Port Huron were still picking up some steelhead and the occasional brown trout. Saginaw Bay: If the weather allows, boat anglers may find some fish when trolling or drifting. Saginaw River: Anglers caught walleye at Bay City when casting from shore. Lots of small ones but anglers did take home some keepers. The lakes in Southwest Michigan had open water. Any ice out there would not be safe. Thanks to the rain and above normal temperatures, it is going to be a while before anglers here are ice fishing. St. Joseph River: Has steelhead in the system but the numbers are slightly below average. The better fishing is usually below Berrien Springs. Try spawn, wax worms or plugs. Kalamazoo River: Is still producing some steelhead. Like the St. Joseph, the number of fish is slightly below average this year. The better fishing this time of year is usually below the Allegan Dam. Grand River near Grand Rapids: Is still producing some steelhead. A few were caught off the wall at the Post Office when using a white jig tipped with a wax worm. Near Fulton Street, anglers were back bouncing with spawn bags. The occasional walleye was caught on bucktail jigs and white twister tails. Grand River near Lansing: Was still producing some pike and walleye for those fishing below the dams. Shiners seem to work better than sucker minnows. No steelhead to report in Lansing however fish were caught near Portland. Try spawn, beads and small spinners. Muskegon River: Recent rain should not affect the river too much. Anglers are still catching some steelhead and brown trout. Many are drifting streamers, plugs, small spinners or spoons. Blue and silver were a good color. We had temps in the single digits last night making more ice for this weekend and many lakes have safe ice. Northern pike and muskie spearing opened on December 1st for all waters except Designated Trout Lakes, Designated Trout Streams and the Michigan-Wisconsin Boundary Waters. Lake Missaukee has 4 to 8 inches of ice and most are fishing from Lake City shoreline as Green Rd is iffy. Call Miller’s Corner @ 231-839-0440 for latest info and the fish are biting. 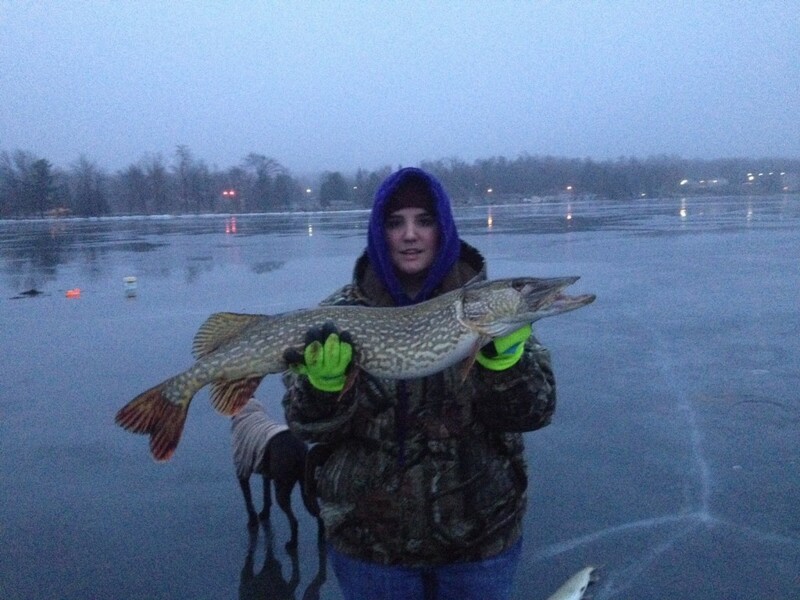 Anglers are ice fishing on some lakes. Those heading out are reminded to use extreme caution and be sure to use a spud to check the ice as you go. The rivers are open at fishable levels and have steelhead just not many anglers are fishing for them. Torch Lake: Those spear fishing did well for whitefish. Elk River: Was producing steelhead at the dam. Manistee Lake: In Kalkaska County had ice anglers. Foot travel was best as the ice was not safe for machines. Most of the fish caught were on the small side. Betsie River: Is producing some steelhead. Lake Cadillac: Has ice. 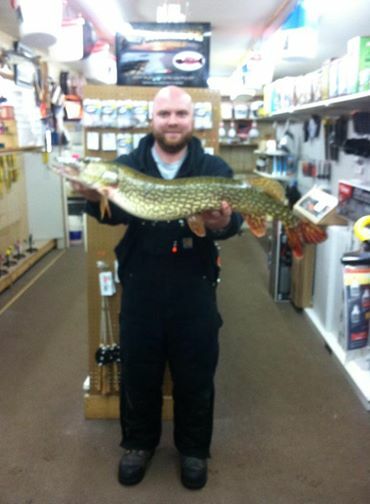 Anglers have done well when spearing for pike. Try jigs and wax worms for panfish. Bring your cleats and be sure to check the ice first. Lake Mitchell: Ice fishing has started. Those heading out caught mostly small pike and panfish. The ice had no snow so be sure to bring your cleats. Lake Missaukee: Ice fishing has started but not all the ice is safe. Most anglers were seen on the northeast side of the lake. Manistee River: Water levels were fishable once again. The river still has a good number of steelhead and other trout. Ludington: Pier and surf anglers were still catching steelhead. Pere Marquette River: Water levels were good and the river still has a fair to good number of steelhead. Grand Lake: Ice anglers were fishing in the shallow bays only. Long Lake: Also had ice anglers fishing in the shallow bays. Thunder Bay River: The number of fish has dropped but anglers were still taking a couple steelhead up near the 9th Street Dam. Otsego Lake: Ice anglers were fishing in shallow waters along the shoreline. Oscoda: Pier anglers fishing at night were still picking up some whitefish and the occasional walleye. Au Sable River: So far, the launch ramps are fine and steelhead are being caught. Water temperatures were in the mid 30’s. The forecast for the weekend looks to be very good for river fishing but it might be a good idea to pack some rock salt or sand just in case the ramps ice up. Lake Margrethe: Ice fishing is underway however anglers need to use caution. 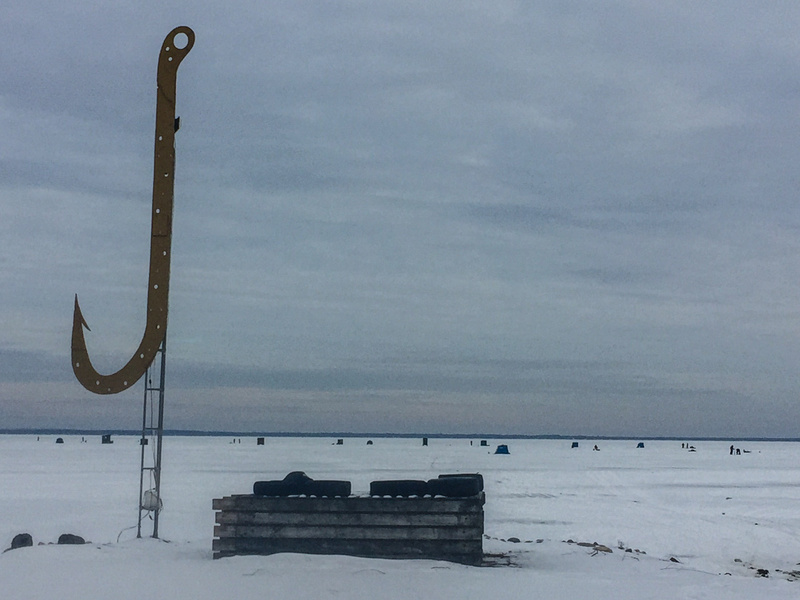 Houghton Lake: Ice anglers can be found off Harvey’s Marina in the East Bay. The ice is clear with no snow so be sure to bring cleats for easier travel. Some are using tip-ups while others are jigging. For walleye, try blues and perch minnows and for pike use anything that has some flash to it. Ice was forming on the inland lakes but snow will slow the freezing process. Those anxious to get out and start fishing need to use extreme caution and avoid the deeper lakes. Little Bay De Noc: Commercial vessel traffic will be utilizing the port of Gladstone beginning Saturday, December 13th and are expected to transit into and out of Little Bay De Noc through December 18th. Recreational users of the ice should plan their activity carefully, use caution, and stay away from the shipping channels and other areas where there is vessel traffic. Ice anglers were fishing above Saunders Point. They caught a few perch, walleye and pike. Anglers need to use caution and watch for pressure cracks with open water. 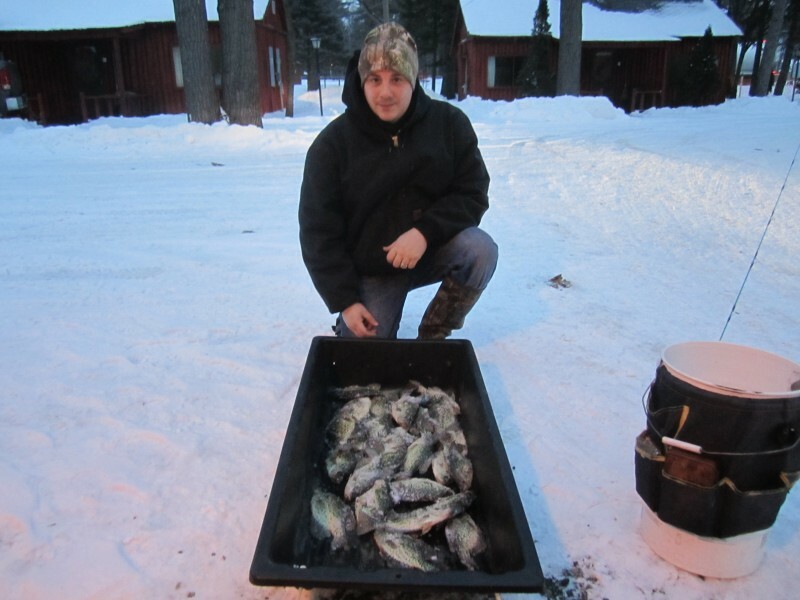 Indian Lake: In Schoolcraft County was producing some perch and walleye. Manistique Lake: A few ice anglers were starting to venture out however it is still early and ice conditions need to be checked carefully. Lake Erie: Perch anglers were fishing off the docks at the Metro Park Marina. Huron River: Is still producing steelhead. Some boat anglers are back trolling with Hot-n-Tots. Detroit River: Had a few boat anglers perch fishing near the Cross Dike. Lake St. Clair: Has open water for the most part. There was a little skim ice in the canals and some of the marinas but nothing close to fishable. There has been a lot of muskie fishing activity over the last week as water clarity has improved. Muskie season closes on December 15th however the end of the season is usually when the biggest fish of the year are caught. St. Clair River: Shore anglers have caught steelhead and brown trout off the wall at Port Huron. A few whitefish were also mixed in. With the warmer temperatures, there are no ice flows coming down the river so fishing conditions are good. Saginaw Bay: Had some anglers fishing the first ice near shore however anglers be warned, the ice is not very thick. No safe ice in southern Michigan, in fact, most of the lakes have opened back up. Steelhead fishing was just alright on rivers in the area. St. Joseph River: Steelhead fishing was fair with most anglers picking up one or two fish per trip. Water levels were still a bit high. Black River: Was producing some steelhead and a few brown trout. Kalamazoo River: Steelhead fishing was fair with anglers usually getting a couple fish per trip. Water levels are still coming down and have started to clear up. Try drifting spawn and wax worms or casting crank baits and plugs. Grand River near Grand Rapids: Is still producing some steelhead. Some days are better than others. Grand River near Lansing: Pike and walleye anglers can be found near the dams. Most are using live bait such as sucker minnows. A few reports came in regarding steelhead at Portland. Try floating a jig with spawn, minnows or crawlers. Muskegon: Piers anglers caught whitefish when jigging a single egg. Muskegon Lake: Was also producing a few whitefish for those fishing at night. Muskegon River: The higher waters levels did bring fresh steelhead into the river system. Those fly fishing have done well with egg patterns. Anglers are catching steelhead, some brown trout and even the occasional lake trout. A few danced on the ice last week on some of the shallow lakes, Houghton Lake, Wixom Lake Coves, a cove or two on Mitchell, and canals on Manistee Lake near Kalkaska. Maybe next week things will start as cold weather returning. There are new owners at Lyman’s on The Lake so stop in and say hello to Kurt, they will have ice shanty rentals this year along with Angelo’s Party Store on Houghton Lake. It’s that time of year when the salmon and trout start to move in closer to shore as they prepare for the annual fall spawning runs. Salmon are starting to trickle into the river systems but no big numbers yet. Those fishing the inland lakes are doing well for panfish, pike, bass and even catfish. Fife Lake has been fair this week on nice perch, Higgins has been good also for perch. Salmon have been slow on both the big lake and the rivers, but river fishing will pick up with rain and cooler weather. It is now legal to use live wigglers. Perch fishing has been slow on grand traverse bay, glen lake, platte lake, lake leelanau, and portage lake. Lake Margrethe has been fair for panfish, also Houghton Lake has been good for panfish. Harbor Springs: Most boats are still fishing on the Petoskey side but the lake trout were too small. Those heading further into Little Traverse Bay caught some bigger fish in 40 to 60 feet. Petoskey: Is still producing a good number of lake trout and the occasional salmon. Most were fishing about 50 feet down but a few salmon were taken 15 to 70 feet down in 80 to 130 feet. Try spoons, plugs, cut bait or a flasher/fly combo. Lake trout were between 40 and 120 feet down in 75 to 130 feet and hitting on spoons, peanuts, plugs and meat rigs. The thermocline dropped 25 feet in one day. Smallmouth bass were caught near the mouth of the river on worms or soft plastics. Pier anglers casting in the early morning caught a limited number of salmon. Bear River: Recent rain did bring a couple small salmon runs up to the dam. Many anglers were out and most were using spawn. Charlevoix: Salmon fishing is still hit-or-miss but a few were caught 55 to 70 feet down in 90 to 130 feet with downriggers and dipseys. They may be higher in the water column. Salmon and lake trout were caught on spoons and dodger/fly combos near the cement plant. Salmon may be starting up the channel into Lake Charlevoix and on their way to the Boyne River and the Jordan River. Sub-legal smallmouth bass are hitting in the channel but some caught keepers using crawlers or leeches on the bottom. A couple walleye were caught just before dark. Medusa Creek was blocked off last week. This means the creek is now closed to fishing within 100 feet of the mouth. Traverse City: Salmon fishing was hit-or-miss in the East Bay. Try spoons or flies 50 to 70 feet down. Good lake trout fishing in 80 to 100 feet and smallmouth bass fishing was good in the shallows. In the West Bay, salmon were caught in the hole and northward. The majority of fish were hitting on spoons or flies 55 to 80 feet down. Lake trout were found in 85 to 100 feet and smallmouth bass were hitting on tube baits, crank baits and crawlers in the shallows. Elk River: Smallmouth bass and panfish were caught below the power dam. Boardman River: A couple steelhead were caught by those using spawn. Salmon were still not running in any numbers but anglers can expect to see them soon. Platte Bay: Most of the coho run is in the East Bay. Warm water has pushed the fish below 60 feet. Try spoons and J-plugs in light blue or wonder bread. Platte River: Fishing is still slow. Those using small dry flies up near the hatchery caught small rainbow trout. Frankfort: Those trolling the harbor and between the piers caught chinook and coho on spoons and J-plugs. Pier and shore anglers caught salmon on spawn and glow spoons in the morning. Betsie River: Is full of king salmon. Anglers reported lots of fish running up river with only a few holding in the holes. Onekama: Those heading out to 120 feet and trolling 70 feet down have caught a few chinook in the mornings when using meat rigs and flies. Chinook, coho and lake trout were also caught in the Barrel. Portage Lake: Bass anglers are landing some nice large and smallmouth but they are working hard to get them to bite. Panfish action was slow. Manistee: Boats are targeting salmon 100 to 150 feet down in 100 to 200 feet with a flasher/fly combo or plugs. Those trolling around the pier caught a few chinook on plugs and pier anglers caught a few on glow spoons. Manistee River: Is still producing summer steelhead for those using streamers, spinners and rapalas. Salmon are starting to show up but no big numbers yet. Ludington: Boat anglers are targeting trout and salmon 40 to 100 feet down in 100 to 250 feet. The best bait was still green meat rigs and plugs. Pier anglers are catching a few salmon when casting glow spoons. Pentwater: Anglers are catching chinook salmon on meat rigs in 60 to 80 feet. The fish seemed to be biting in 60 degree water. Catch rates were spotty as changing wind directions affected catch rates. Pier anglers using live bait caught a couple smallmouth bass. Cheboygan River: Anglers caught large and smallmouth bass near the mouth. Rogers City: Is producing a mix of chinook, steelhead, lake trout, pink salmon and the occasional walleye. Start shallow early and then move out deeper. Run lines up and down the water column for best results. Spoons, J-plugs, and attractors with squid, flies and cut bait are working. Smaller fish were caught up by the lighthouse at Forty Mile Point. No big numbers yet but a few salmon were caught around Swan Bay. Alpena: A few anglers heading out for walleye found fish when trolling crank baits in 30 to 35 feet near Grass Island, Sulphur Island and North Point. Good lake trout fishing with the occasional steelhead or pink salmon taken in the area known as the “Humps”. Thunder Bay River: Is producing a few catfish and panfish. Anglers are using live bait such as crawlers and leeches. Harrisville: Salmon should be in the area soon. Steelhead, lake trout and walleye have been moving closer to the harbor. Start shallow and head deeper. Fish were holding at 20 to 75 feet straight out and north of the harbor. Use dark colored baits. Oscoda: Pier fishing was just starting to heat up as a few salmon and steelhead seem to be moving in closer. Pier anglers are using glow spoons or body baits. Boat anglers are fishing the upper half of the water column in 40 to 80 feet with spoons, dodgers and flies, squid and stick baits. Au Sable River: Seems to have a good number of walleye between the mouth and the dam. They are hitting on crawlers, leeches and body baits. Early morning and late evening were best however don’t rule out the mid-day catch. Tawas: Those trolling had to work a little harder to find walleye. A few fish were taken off Buoy #2, inside the bay near Buoys 4 and 6 and down near Alabaster. Au Gres: : Walleye fishing slowed with only a fish or two taken per trip. Many were fishing in 25 to 40 feet south of Pointe Au Gres. Those trying for perch had little success. Au Gres River: A couple catfish were caught in the lower river however dredging continues to hamper fishing. Keweenaw Bay: Anglers at all ports had good days and bad days. Lake trout were caught between Witz Marina and the Huron Islands in 50 to 90 feet. The occasional salmon was caught in the evening from Sand Point north to the Keweenaw Bay Red Rocks in 60 to 90 feet. Lake Antoine: Anglers are still catching smaller bluegills, yellow perch, sunfish and rock bass when drifting crawlers. Bass anglers are taking a good number of fish when casting crank baits. Marquette: The few anglers able to get out caught a few small chinook and lake trout out towards Shot Point and Granite Island. Those fishing the mouth of the Carp River had no luck when casting spoons or using spawn and crawlers. Water levels were high and turbid after all the rain. Little Bay De Noc: Walleye fishing was pretty good considering the weather but perch fishing was the main target for many. Fair to good catches were reported in 12 feet off Garth Point and 8 to 17 feet around the Second and Third Reefs. Crawlers and minnows worked best. Pike were active throughout the Bay. Fish were caught in the Escanaba Yacht Harbor, mouth of the Escanaba River, at Kipling near the power plant and the Day’s River. Most are trolling or casting spoons, spinners and crank baits in 8 to 14 feet. Salmon anglers caught fish 40 feet down in 70 to 80 feet north of the Ford River Can. Big Bay De Noc: Anglers targeting smallmouth bass had mixed results. Ogontz was fair to good for those using crawlers, crank baits or tube baits in 8 to 12 feet or 6 to 30 feet in Kate’s Bay and Garden Bluff. Catch rates for perch in Garden Bay slowed and most of the fish were too small. Pike action was fair to good in 8 to 16 feet from Kate’s Bay to Ansell’s Point. Those fishing off Fairport had fair to good catches of salmon 40 to 60 feet down in 80 to 110 feet near the “Gap” and 60 to 90 feet down in 120 to 150 feet south of Poverty Island. Au Train: Those targeting lake trout had fair success as some reported five to ten fish in six hours of fishing off the Shelter Bay Flats and the Wood Island Reef. Try spoons within 20 feet off the bottom in 150 feet. No activity at the Rock River because of high water levels. Munising: Boat anglers are targeting lake trout when they can get out but some are starting to shift toward salmon. Catch rates for lake trout were fair to good around Trout Bay, the Wood Island Reefs and east of Grand Portal. A few trolling for salmon and splake within the bay had no success. Pier fishing was very slow. Grand Marais: Boats targeting lake trout were still heading north and west out to the shipping channels. They caught fish ranging between 2 and 5 pounds. Catch rates were good off the southwest bank near Caribou Island and some reported limit catches of 3 and 4 pound fish taken in 100 to 200 feet. No salmon to report. Some were still trying offshore at the Marina but had no luck. St. Mary’s River: Pink salmon have arrived in good numbers and anglers did well trolling large pink spoons. Shore and pier anglers are also catching fish on the same spoons when casting near Valley Camp, the dock at the Locks boat tours and from the blue hand rail next to Clover Land Power Plant. Limit catches of Atlantic salmon were taken on the discharge side of the power plant when drifting brown or cream colored flies. Some bigger fish were caught on streamer type flies. A couple rainbow trout were caught above the power plant on Portage Street when drifting burgundy colored flat fish with a chrome belly. The whitefish bite slowed. Moving downstream to Lake Nicolet, walleye were caught off 4 and 6 Mile Roads when trolling bottom bouncers and crawler harnesses just off the shipping channel in 18 to 20 feet. A few yellow perch were taken at the lower end of the Rock-Cut near the red buoy in 8 to 14 feet. Pike were caught at the mouth of the Munuscong River where anglers are trolling dark colored bucktail spinners just off the weed beds in 6 to 8 feet. Good smallmouth action off the Raber launch and the pier. Most are still-fishing crawlers or casting tube jigs in 4 to 8 feet off the old dock pilings and rocks. Detour: Anglers are catching lake trout and pink salmon however the harvest for chinook salmon was slow. They are trolling from the city launch to Frying Pan Island, to the #3 Green Can, around the lighthouse and to the #2 Red Can. Yellow perch were caught at Sweets Point and a few walleye were taken off Drummond Island near Dix’s Point. Cedarville and Hessel: Perch fishing was good out of Hessel at the first cut in 10 to 12 feet and on the east side of the docks in 8 to 9 feet. Those targeting pike have done very well in Hessel Bay, Musky, Bay, Government Bay and the Middle Entrance when using chubs. Perch fishing in the Middle Entrance and the east end of Cedarville Bay was starting to pick up. Carp River: Chinook salmon are starting to bite at the mouth. St. Ignace: Anglers caught chinook, lake trout and pink salmon between the fuel tanks and the southwest corner of Mackinac Island. Most are using spoons. Green and gold, white with colored strips or silver and blue were the most popular colors. Lake Erie: Had some good perch numbers when conditions were right. Anglers were fishing straight out from Stony Point in 24 to 26 feet and about a half mile south. Fish were caught near the E-Buoy but many were small. Try using bigger minnows to avoid the small perch. Fish were also caught near the Raisin River Buoys and Turtle Island. A few remaining walleye could be found as shallow as 8 feet in the early morning or late at night in Brest Bay or in front of the Fermi Plant. Detroit River: Anglers are still finding some perch near and south of Celeron Island. Try minnows in 12 to 14 feet. Walleye anglers were targeting the waters in the Trenton Channel. Portage Chain-of-Lakes: Bass anglers are doing best in the areas with a current. In the morning, try the shallow flats and move deeper mid-day. Bluegills have been caught at various depths but the bigger ones seem to be suspended about halfway down in 15 to 20 feet. Try crickets and crawlers on small jigs. Lake St. Clair: Smallmouth bass fishing has been very good in Anchor Bay and south of Huron Point with plastic baits or live minnows. Walleye fishing has been slow. Perch fishing was slowly improving with some decent catches coming from the Dumping Grounds and along the shipping channels. A few perch were also caught near the B-Marker in Anchor Bay. St. Clair River: Walleye fishing remains very good after dark around Port Huron. Daytime fishing was spotty with a few fish taken on crawler harnesses or jigs. Sturgeon fishing has been good for those using worms. Try the North Channel between Decker’s Landing and Algonac. Port Sanilac: Anglers caught chinook and steelhead 60 to 70 feet down in 75 to 90 feet of water with 5 and 10 color lead core and orange or metallic spoons. The better fishing seems to come with a west wind. Perch anglers were out but no fish were caught. Harbor Beach: Was a hot spot with anglers trolling north of the harbor and up near Port Hope where they caught a mix of lake trout, steelhead and even some walleye in 80 to 115 feet. Lake trout were 70 to 80 feet down and the steelhead were 20 to 40 feet down. Try orange or copper and green spoons. Pier anglers caught smallmouth bass. Port Austin: Windy weather made for difficult fishing however when boats can get out they did get some lake trout in 140 feet. Saginaw Bay: A few walleye were taken in 11 to 14 feet off the Pinconning Bar and near the Black Hole but those trolling had to work hard to get them. They are still getting the occasional walleye out from the Slot in 12 to 14 feet. A few perch were caught however anglers will need to sort out the small ones. Catfish were caught from the Hot Pond and shore anglers are Essexville were still taking a few bass, catfish and freshwater drum. The inland lakes continue to provide good bluegill fishing in deeper waters. Anglers are using crickets, leaf worms, or a wax worm and fly combination. St. Joseph: Salmon anglers have done well in 80 to 110 feet. The better fishing was early in the day and most were caught on spoons. A few perch were caught in 40 to 50 feet. Pier fishing was slow for trout and salmon however anglers caught freshwater drum and catfish. South Haven: Was producing lake trout and salmon in 70 to 120 feet. Anglers are using spoons and meat rigs. Both perch fishing and pier fishing were slow. Kalamazoo River: Has good smallmouth bass fishing in Marshall, Comstock, Kalamazoo, and Plainwell. Port Sheldon: Chinook salmon fishing is picking up. A thermocline is finally setting up for the first time this summer. Fishing was good in 120 to 135 feet when using J-plugs, spoons and meat rigs. Grand Haven: Anglers were fishing 60 to 110 feet down in 115 to 175 feet. Some had 300 feet of coppers working well for them but the best bite was on a spin/fly combo up high or a paddle/fly combo deeper. Hot colors were white and UV followed by green or green and white. Some are using anything that glows or meat rigs in any color. Pier fishing was slow. Grand River near Lansing: The fish ladders are open which will allow the fall steelhead and salmon to migrate to the Moore’s Park Dam. Muskegon: Pier anglers were casting or jigging for salmon but had no luck. Boat anglers were fishing 60 to 110 feet down in 120 to 170 feet with a spin/fly combo up high or paddle/fly combo down low. Those using meat rigs caught fish as well as those using anything that glows. Muskegon River: Continues to provide good smallmouth bass fishing. Whitehall: Anglers found fish 70 feet down in 150 to 200 feet. Meat rigs worked best. Downriggers may start working better as the fish were no long near the top of the water column. Pier anglers caught a couple salmon but no big numbers yet. Walleye action in the channel was good one day and cold the next. White Lake: Was producing some large panfish. Today is forecast to be Much Warmer than yesterday. Snow developing overnight tonight. Mainly cloudy. A few peeks of sunshine possible. High 17F. Winds light and variable. Snow during the morning will taper off and give way to cloudy skies during the afternoon. High around 25F. Winds light and variable. Chance of snow 80%. Snow accumulating 1 to 3 inches. Mainly cloudy. High 26F. Winds SW at 5 to 10 mph. Mainly cloudy with snow showers around in the morning. High 24F. Winds NNW at 10 to 15 mph. Chance of snow 50%.